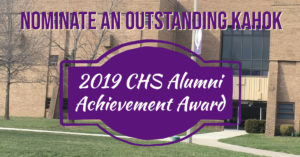 Collinsville High School is accepting nominations for the 2019 Alumni Achievement Award. The award is presented every year during the school’s spring graduation ceremony. The Alumni Achievement Award recognizes a Collinsville High School graduate who has distinguished him/herself after leaving CHS. Nominations, with supporting information, should be forwarded to Collinsville High School Principal David Snider. Please be sure to include contact information for the nominee, as well as the person making the nomination. ALL SUBMISSIONS MUST BE RECEIVED NO LATER THAN FRIDAY, FEBRUARY 22, 2019.